Editor’s note: During Donald Trump’s recent visit to Clow UFO Base, presumptive Republican Nominee Donald J. Trump agreed to an interview with our Reporter X. The following is an excerpt from that interview. The full interview can be found in this week’s print edition. Reporter X: Thank you for taking the time to talk to us. Trump: Of course. (Mayor Roger Claar) said I shouldn’t talk to you. So I’m talking to you. You see, Roger is not a smart guy right now, but he could be smart. It just goes to show that you don’t have to be smart to run a UFO base. You know, I wanted my own UFO Base back in the 1990s. It would have been bigger than this place, and have more class. So I asked the Order of the New World if I could have one, and they said I needed the President’s approval. I knew he wouldn’t, because he’s so weak that he doesn’t have the courage to give me a base, because he knows I can do a better job than he can. So I decided to run for President so I could have my own base. Now I realize how dumb our leaders are, so I want to do more than run my own glorious UFO Base. I want to rule the planet. But not be the policeman of the world, but I will attack if I feel like it. Reporter X: That’s a lot to take in. Reporter X: Let’s get back to what you said about the Mayor. Trump: What did you just do? What you just did? Reporter X: Me? I’m asking aa follow up question. Trump: A follow up question? Reporter X: Yes. I want to talk more about what you said earlier. Trump: I’ve been interviewed by many smart people. Good people. They just ask me a question, let me talk, and then ask the next question. None of this following up business. The smart ones don’t ask follow up questions. That’s dumb! Reporter X: We prefer to think of it as old-fashioned journalism. Trump: No smart person interrupts me! You are must not be smart! Smart people let me talk. Reporter X: Then let’s talk about Mayor Roger Claar. Trump: He could be a smart person if he renounced his past support for Jeb Bush. Instead he won’t talk to me. Donald Trump has gotten more votes in one year, than he’s gotten in his entire career. Sad. I should tweet that. Reporter X: There’s a difference between running for President and running for mayor of a village. Trump: I bring in new people to the Republican Party. How many new people has Roger brought to Bolingbrook? Reporter X: Quite a few, but let’s move on. You’ve been familiar with aliens since the 1990s. As President, what will be your interstellar policy, and do you stand by your threat to bomb the Martian Colonies? Trump: Let me make this clear. I love little green men! I love all of them. Reporter X: You do realize that many aliens consider that an insult. Trump: Are you bleeding political correctness from unmentionable places? Look, I’m speaking to smartest people, and I am only going to surround myself with the best people. Alex Jones will be my representative to the New World Order. Reporter X: But he hates the New World Order. Trump: He’s the best. And Art Bell will be my advisor on alien stuff. Reporter X: Art Bell is well known in among the general public, but the Republican Party has a covert team of extraterrestrial experts with decades of experience. Why not use them to help you. Trump: They’re the establishment, and this campaign is about the people empowering me reorganize world. In fact, the American People will know I’m serious when I announce Meatloaf as my running mate! There’s no way Hillary can counter our ticket. Everyone who is not Fox News will realize that I am the only man to beat, and I’m serious about defeating Hillary (expletive deleted) Clinton! Are you still dumb enough to ask another follow up question. 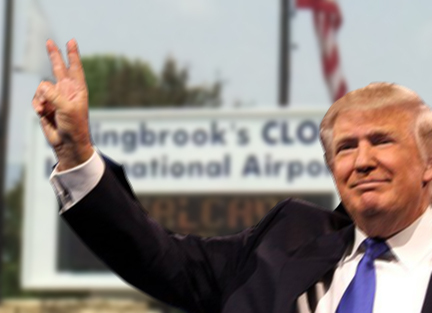 Trump: Bolingbrook Babbler. I’ve never seen a printed copy. Bad web site. Lost it’s audience since it stopped being nice to atheist thought leaders. Pathetic.